The classic Hollywood style mystery successfully pulls into the station. Grab your ticket from the box office and board the legendary Orient Express with this all-star cast. Kenneth Branagh’s adaptation of the timeless Agatha Christie novel is as bold and elaborate as Hercule Poirot’s famous mustache. Feel as though you are traveling aboard the famous transcontinental train as you attempt to put all the pieces together to solve the mystery right along with “quite possibly the greatest detective in the world.” Hollywood style movie mysteries are nearly a thing of the past, but Branagh stokes the fire in the engine of the once popular genre and conducts an exciting journey through the classic whodunit plot. The film’s namesake is a novel that has inspired so many mystery novelists, and hopefully this film inspires a new generation of filmmakers to create their own movie mysteries fit for the big screen. Because the 1974 version including a cast ranging from Ingrid Bergman to Anthony Perkins to Sean Connery has not stood the test of time as well as it was thought to have done, this cleared the tracks for Branagh’s adaptation of Christie’s most famous novel. After he successfully solves the mystery of the theft of precious religious artifact from the Wailing Wall area of Jerusalem, Hercule Poirot (Branagh) is beseeched to head back east to solve another mystery. Over the years, Poirot has made many friends, and one of these friends is the son of the railroad tycoon who owns the opulent Orient Express. When a passenger doesn’t show, Poirot is given his seat and boards the transcontinental train bound for western Europe. Although Poirot was promised a rail journey free of crime, a nice break, and to be pampered during his travels, he finds himself solving the most peculiar of mysteries–a most gruesome murder. The victim: an unscrupulous man with many enemies. 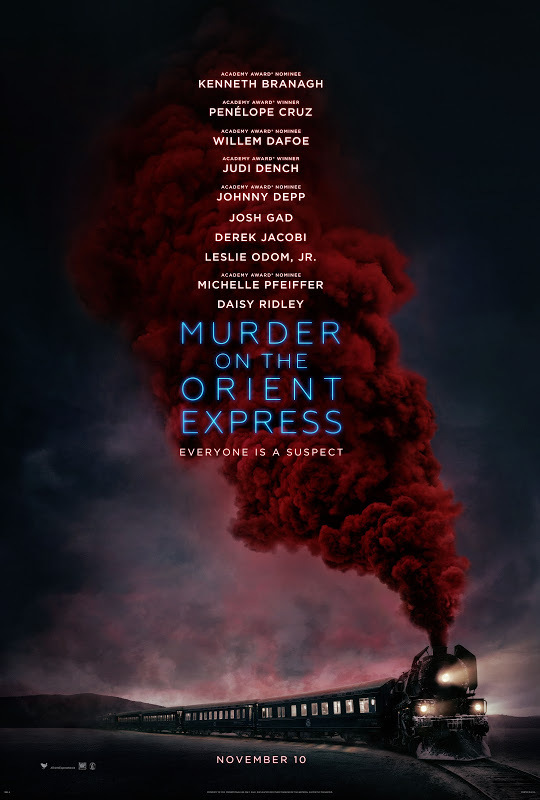 When a freak avalanche forces the Orient Express to stop on a breathtaking, precarious stretch of track, Poirot finds the time to interview each and every one of the suspects—confined to the twelve first and second-class passengers who might have had access to the victim’s cabin. When each piece of evidence opens one Pandora’s Box after another, and the web of lies and connections between the passengers grows to Poirot’s mustache proportions, Poirot faces a complex mystery that prompts him to call his very approach to crime solving into question. Nevermind the solution to the tentpole mystery novel is one of the worst-kept secrets in British literature history, Branagh crafts a cinematic mystery full of intrigue, revenge, lies, deceit, and the central murder. The plot revolves around a seemingly perfect crime committed on a railcar with no access to the outside, and only the passengers and crew on board the suspects. But even Poirot is stumped at the who, how, and why. Whether you know the ending or not, this film provides an excellent example of a genre that harkens back to Hollywood’s golden era. There was once a time that mysteries and musicals were a staple of the industry, but times change. Still, Branagh shows audiences that the timelessness of an old fashioned whodunit cannot be overstated. Since the ending of the mystery is known by so many people, Branagh was challenged with providing the audiences with something different, something that creates a new take on a well-known story. He accomplishes this by throwing in some additional subplots, character connections, and evidence that suggests that the solution may turn other otherwise than it does in the novel. The changes he brings to the story are organic and fit in well. The end result is a fantastic film that keeps your attention from beginning to end, even for those who know–or think they know–the solution to the mystery. From the sweeping landscape shots of the Alps to the wide variety of shots to bring the audience onto the train with the rest of the passengers, the production design is excellent. The attention to the detail and visual elegance of the story are treated with creative precision, just as the Christie plot is woven together. Production designer Jim Clay’s meticulously recreated Orient Express is truly something to behold. Unfortunately, despite Branagh’s decision to shoot on 65mm film, there are times that the train set feels almost too perfect–a little artificial–similar to The Polar Express. Although there are times that the production design is not being showcased to the degree that it should to increasingly immerse the audience into the world of Poirot, there are plenty of beautiful shots that serve as a testament to the opulence of rail travel that once was. Of the few weak areas of this film, the cinematography is the weakest because it could have been used to truly create a visually stunning film and not fall victim to surrealism. Patrick Doyle’s score complements the film by feeling like an extension of the plot itself, in time and space. The combination of big band, jazz, and orchestral music immerses the audience into this world. All the technical elements work effectively to transport you from your seat to a compartment on the legendary train. Branagh’s screen adaptation of Christie’s characters is brilliantly entertaining and developed well. Each character represents a different type of person, a different walk of life. No two characters are alike, which makes great for interjecting some social commentary into the mystery. From a professor spouting pro-Nazi sentiments to a nurse turned missionary, you will find the characters intriguing in and of themselves, never mind how they may be connected to the victim. Alexandra Byrne’s costumes are perfect appointed extensions of the characters that wear the authentic period clothing. Each costume was designed to be as much a part of the respective character as the accents, hairstyles, and backstories. Josh Gadd proves that we can successfully play a serious role, which will prove to bolster his career, Willem Dafoe is perfect as the professor, Dench portrays the princess in only a way that she could so successfully accomplish, and the rest of the cast are all excellent. Coming in a close second to Branagh’s screen time, as the iconic inspector Poirot, is the beautifully talented Michelle Pfeiffer as the widowed heiress Mrs. Hubbard (Lauren Bacall’s character in the original). She truly showcases her talent for adding depth to the characters she plays in order to make them complex and memorable. The diverse cast of characters is incredible to watch and couldn’t have been deleted better for this highly anticipated film. Climb aboard The Orient Express for the whodunit that started it all. Branagh’s fresh take on the classic tale would satisfy even the harshest of critics Agatha Christie herself. He treats the source material with the respect it deserve, all the while, adding in new material to craft a new experience for those tho have read the novel and/or seen the original film adaptation of this story. Do yourself a favor and don’t ask anyone whodunit, because you need to experience the solution for yourself. Perhaps you can solve it more quickly than Poirot. Don’t let the train leave the station before you pack your bags and travel back to a time when trains went full-steam ahead into adventure and intrigue.